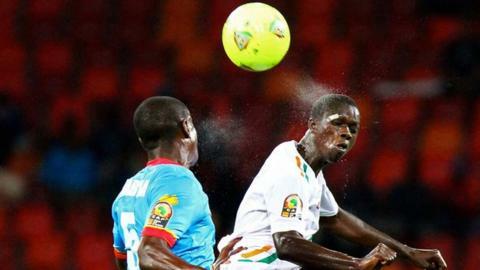 Niger earned their first point at the finals of the Africa Cup of Nations after holding DR Congo to a draw. Both sides wasted chances in a low-quality game of poor finishing, although Niger's Modibo Sidibe was unlucky to see his shot hit the post. In contrast, DR Congo's Dieumerci Mbokani missed two gilt-edged chances, even if credit must go to keeper Daouda Kassaly for making two smart saves. The result means all four teams in Group B can still qualify. Niger now have one point and play Ghana, who have four, in their final group game on Monday. At the same time DR Congo, with two points, play Mali, who lost to Ghana earlier on Thursday but won their opening match against Niger. Thursday's disappointing encounter was a game in keeping with a poor tournament so far - and was the seventh draw in 12 matches. But it might have been so different had either side been able to take any of the chances that came their way. Niger were gifted a glorious opening early on when Sidibe robbed Larrys Mabiala to earn a clear run on goal. The Akokana striker appeared to do everything right as he opened up his body to curl a right-foot shot goalwards but the ball cannoned back off the foot of the post. It was a sign of things to come as both sides wasted chances, particularly in the first half. DR Congo, the heavy favourites to win the match, could have had three or four goals in the opening period as opportunity after opportunity fell to their big-name players. Lomana LuaLua twice sent shots horribly off target but those misses looked tame compared to the profligacy of Mbokani. The normally clinical Anderlecht striker should have scored with a sidefoot volley from 12 yards but was denied by an excellent save by Kassaly. Niger then threw away a good chance when another mistake from Mabiala - the only new man in either starting line-up - handed Sidibe a shooting opportunity which ended with the ball being lashed into the stands. The quality of the game was summed up when Niger defender Mohamed Chicoto missed the ball and kicked the air when attempting to clip a pass up the flank while under no pressure. Two-time Nations Cup winners DR Congo really should have lived up to their pedigree by converting two excellent chances at the end of the half. Instead, Youssouf Mulumbu stroked the ball wide from the edge of the area and then the normally clinical Anderlecht striker Mbokani hit straight at Kassaly following a three-on-one break. There was little change in the pattern of the game after the interval, with the play too often broken up by errors and fouls. Moussa Maazou, the Niger talisman, finally started to have an impact having been anonymous in the first half. The Etoile du Sahel striker tested Robert Kidiaba with a drive from the edge of the area and then brought out a better save from the Leopards keeper, who was at full stretch to prevent Maazou's header going past him into the top corner. But it did not inspire his team-mates - or indeed spark DR Congo into action as the game deteriorated and almost came to a standstill at times, with the pace pedestrian to say the least. Right at the last, Boubacar Talatou might have won it for Niger but he could not find a finish that had been lacking all night as his countrymen had to settle for clinching their first Nations Cup point rather than a win. "We are happy to make Nigerien football history [by earning a first Nations Cup point]. The players gave everything. "When you see a team with so much heart and talent, and in which some players do not have a club, we can only be proud of them. "We improved from the first game, not just in terms of the result but also our performance." "It's a missed opportunity. It was possible for us to move forward. We have to concede that after we missed the two chances we did not play well."